That's exactly what this extremely moist carrot cake does. 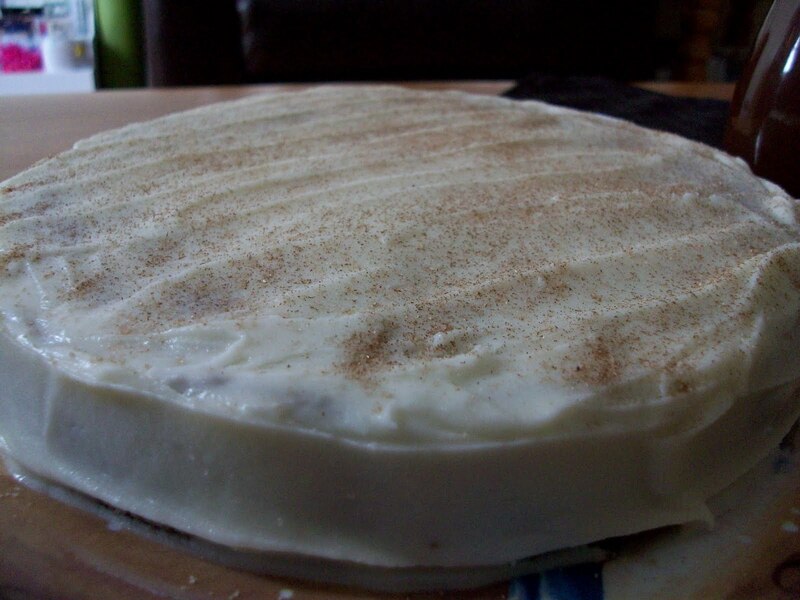 The addition of grated apple and apple sauce really gives the cake its moisture, and the spices warm it up so you can stay safe from those bitter winter winds. It's all topped off with a thick maple cream cheese frosting that will make anyone go back for seconds! So give the recipe a try and let me know what you think! Spray and 8" pan with non-stick spray. In a small bowl, combine sugars, butter and maple syrup until well-blended. Add buttermilk, egg, and applesauce. Mix well. In a large bowl, combine flour, spices, salt, baking soda, and baking powder. Fold in apple and carrot. Let cool in pan for 10 minutes then remove from pan and continue cooling on a wire rack. -Combine cream cheese and butter. -Add rest of ingredients and mix until smooth. I have never had apple in my carrot cake but it sounds like a divine combination that is perfect for this time of year. Thanks for this Apple Carrot Cake recipe. I think Maple Cream Cheese frosting is a great touch!